Paul Kemp is the founding director of the International Centre for Ecohydraulics Research (www.icer.soton.ac.uk) and Editor in Chief of the IAHR Journal of Ecohydraulics (www.tandfonline.com/tjoe). He is also director of the EPSRC funded Centre for Doctoral Training in Sustainable Infrastructure Systems (www.cdt-sis.soton.ac.uk), Principle Investigator for the EPSRC funded “Vaccinating the NEXUS” project (www.nexus.soton.ac.uk), and chair of the University Strategic Research Group (USRG) in “NEXUS Science”. His research interests relate to the development of more environmentally sustainable water, energy and food systems. He is particularly interested in the application of behavioural ecology to understanding and solving challenges in water and energy engineering. The ethos of his research is the return to fundamental science to solve applied problems in sustainable infrastructure development. Particular interests relate to how the physical environment (e.g. hydrodynamics and acoustics) influence the behaviour and physiological performance of fish, and how manipulation of that environment by engineering means can be used to mitigate for negative impacts of water and energy resource development. Specific applications include fish pass and screening design, assigning compensation flow regimes, and improving habitat restoration strategies. Paul has extensive experience advising governmental and non-governmental organisations on ecological engineering, particularly fish passage and screening, including the Parliamentary Office of Science and Technology, DEFRA, the Environment Agency, the Scottish Executive, EU, the Chinese Ministry of Water Resources, US regulatory agencies, and the Brazilian Hydropower Industry. In education, Paul leads modules in "River and Fisheries Restoration" and "Sustainable Infrastructure Systems". The University's International Centre for Ecohydraulics Research focuses on protecting certain species of fish from water engineering practices. Watkin, L., Kemp, P. S., Williams, I. D., & Harwood, I. A. (2012). Managing sustainable development conflicts: the impact of stakeholders in small-scale hydropower schemes. Environmental Management, 49(6), 1208-1223. Maddock, I., Harby, A., Kemp, P. S., & Wood, P. J. (Eds.) (2013). Ecohydraulics: an integrated approach. Chichester, GB: Wiley-Blackwell. Kemp, P. S. (Ed.) (2010). Salmonid fisheries: freshwater habitat management. (Games & Wildlife Conservation Trust). Oxford, GB: Wiley-Blackwell. Vowles, A., Eakins, L. R., Piper, A. T., Kerr, J., & Kemp, P. S. (2013). Developing realistic fish passage criteria: an ecohydraulics approach. In I. Maddock, A. Harby, P. Kemp, & P. J. Wood (Eds. ), Ecohydraulics: an Integrated Approach (pp. 143-156). Chichester, GB: Wiley-Blackwell. Maddock, I., Harby, A., Kemp, P., & Wood, P. J. (2013). Ecohydraulics: an introduction. In I. Maddock, A. Harby, P. S. Kemp, & P. J. Wood (Eds. ), Ecohydraulics: an integrated approach (pp. 1-6). Chichester, GB: Wiley-Blackwell. Maddock, I., Harby, A., Kemp, P. S., & Wood, P. (2013). Research needs, challenges and the future of ecohydraulics research. In I. Maddock, A. Harby, P. S. Kemp, & P. J. Wood (Eds. ), Ecohydraulics: An Integrated Approach (pp. 431-436). Chichester, GB: Wiley-Blackwell. Kemp, P. S. (2010). In-channel placement of structure to enhance habitat complexity and connectivity for stream-dwelling salmonids. In P. S. Kemp (Ed. ), Salmonid fisheries: freshwater habtiat management (pp. 55-80). (Games & Wildlife Conservation Trust). Oxford, GB: Wiley-Blackwell. Worthington, T., Vught, I., De Charlroy, D., Kemp, P. S., Coeck, J., Osborne, P. E., & Easton, K. (2008). The reintroduction of the burbot to the United Kingdom and Flanders. In P. S. Soorae (Ed. ), Global reintroduction Prespectives: Reintroduction Case Studies from Around the Globe (pp. 26-29). Abu Dhabi: IUCN/SCC Reintroduction Specialist Group. Watkin, L., Kemp, P. S., Williams, I. D., & Harwood, I. A. (2010). Sustainable hydropower and soft systems methodology: a systems approach to complexity and conflict. Poster session presented at Hydrology Conference 2010. The Changing Physical and Social Environment: Hydrologic Impacts and Feedbacks, . Watkin, L., Kemp, P. S., Williams, I. D., & Harwood, I. A. (2009). Understanding the role of the stakeholder in environmental conflicts: the case of hydroelectric power. Poster session presented at Institute of Fisheries Management, Fisheries in a Changing Climate, . Russon, I. J., & Kemp, P. S. (2008). Behavioural response of migrating adult European eels, anguilla anguilla, to hydraulics associated with undershot or overshot weirs. Paper presented at Hidroenergia, . Kemp, P. S. (2008). Bridging the gap between hydraulics and fish behaviour: the application to fish passage. Paper presented at British Hydrological Society National Meeting, . Kemp, P. S., Russon, I. J., Vowles, A., & Muller, G. (2008). Considerations of multiple species fish passage associated with the development of small-scale hydropower. Paper presented at Hidroenergia 2008, Slovenia. Kemp, P. S., Tsuzaki, T., Russon, I. J., Moser, M., Muller, G. U., & Lucas, M. (2007). The behavioural response of river lamprey (Lampetra fluviatilis) to two types of experiment weir.. Paper presented at Sixth International Ecohydraulics Symposium, . Kemp, P. S., & Osborne, P. E. (2007). The feasibility of reintroducing burbot (Lota lota) to the British Isles. Paper presented at XII European Congress on Ichthyology, . Kemp, P. S., Gessel, M. H., & Williams, J. G. (2006). Fish behaviour and passage efficiency: lessons from North America.. Paper presented at European Inland Fisheries Advisory Commission Twenty-Fourth Session, . Kemp, P. S. (2006). 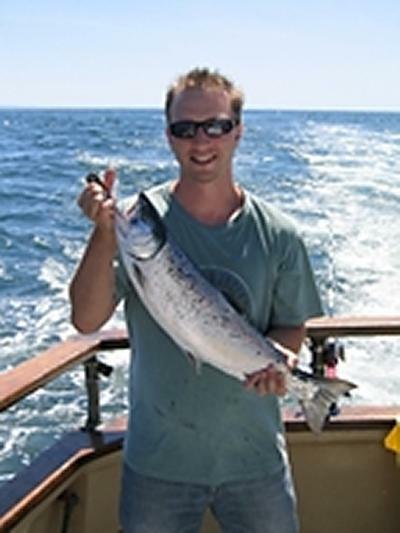 The response of migrating juvenile Chinook salmon smolts to instream structure associated with. Paper presented at Proceedings of the Tenth International Symposium of Regulated Rivers, Stirling, Scotland., . Kemp, P. S., Gessel, M. H., & Williams, J. G. (2004). Seaward migrating juvenile pacific salmon avoid conditions of rapid hydraulic transition and overhead cover.. Paper presented at Proceedings of the 5th International Symposium on Ecohydraulics, . Kemp, P. S. (2002). Discharge, habitat complexity and social status: the influence of abiotic and biotic factors upon habitat suitability curves and the performance of juvenile Atlantic Salmon, Salmo salar. Paper presented at Fourth International Ecohydraulics Symposium, . Kemp, P. S., Russon, I. J., Waterson, B. J., O'Hanley, J., & Pess, G. R. (2008). Recommendations for a "coarse-resolution rapid-assessment" methodology to assess barriers to fish migration, and associated prioritization tools. Southampton, UK: International Centre for Ecohydraulic Research. Lucas, M. C., Greaves, R. K., Bubb, D. H., & Kemp, P. S. (2007). Stanley Mills lamprey project. (Scottish Natural Heritage Commisioned Reports; No. Report No: 256 (ROAME No. F04LH03)). Redgorton, UK: Scottish Natural Heritage.